M. Cohen-MacFarlane, J. Green, F. Knoefel, R. Goubran. “Characterization of fiber optic pressure mats for long term patient monitoring (poster).” Bruyère Research Institute Poster Day, Ottawa, ON, September 24, 2015. T. Grant, M. Bryanton, M. Taylor, H. Sveistrup, M. Bilodeau, F. Knoefel, R. Goubran, J. Jutai. “Sit-to-stand (STS) timing among older adults in their homes: Two measurement approaches.” Gerontechnology2014;12(3):153-158; doi:10.4017/gt.2014.12.3.006.00. T. Grant, M. Bryanton, M. Taylor, H. Sveistrup, M. Bilodeau, F. Knoefel, R. Goubran, J. Jutai. “Comparison of two approaches for the measurement of sit-to-stand among older adults in their homes.” Canadian Association on Gerontology Conference, October 17, 2014, Niagara Falls, Ontario, Canada, abstract 044. M. Taylor, T. Grant, F. Knoefel, R. Goubran. “Bed occupancy measurements using under mattress pressure sensors for long term patient monitoring of community-dwelling older adults.” IEEE International Symposium on Medical Measurements and Applications (MeMeA), Gatineau, QC, Canada, May 4, 2013, paper #1569706789, pp. 130-134. [doi:10.1109/MeMeA.2013.6549721]. F. Knoefel, L. Patrick, J. Taylor, R. Goubran. “Dual-Stiffness Flooring: Can it Reduce Fracture Rates Associated with Falls?” JAmMedDirAssoc, April 2013; 14(4): 303-5. F. Knoefel, M. Taylor, T. Grant, S. Rocan, J. Jutai, H. Sveistrup, R. Goubran, J. Taylor, M. Bilodeau. “Unobtrusive Home Bed Transfer Monitoring in an Older Adult.” Canadian Association on Gerontology Annual Scientific Conference, Vancouver, BC, October 2012. V. Joshi, M. Holtzman, A. Arcelus, R. Goubran, F. Knoefel. “Highly Survivable Bed Pressure Mat Remote Patient Monitoring System for mHealth.” In proc. of IEEE International Conference of the Engineering in Medicine and Biology Society (EMBC), San Diego, California, USA, September 2012, pp. 268-271. D. Townsend, R. Goubran, F. Knoefel. “Time Domain Characterization of Window Length and Type on Moving Variance Signal Features.” In proc. of IEEE International Symposium on Medical Measurements and Applications,Budapest, Hungary, May 2012. F. Knoefel, L. Patrick, R. Goubran, and J. Taylor. 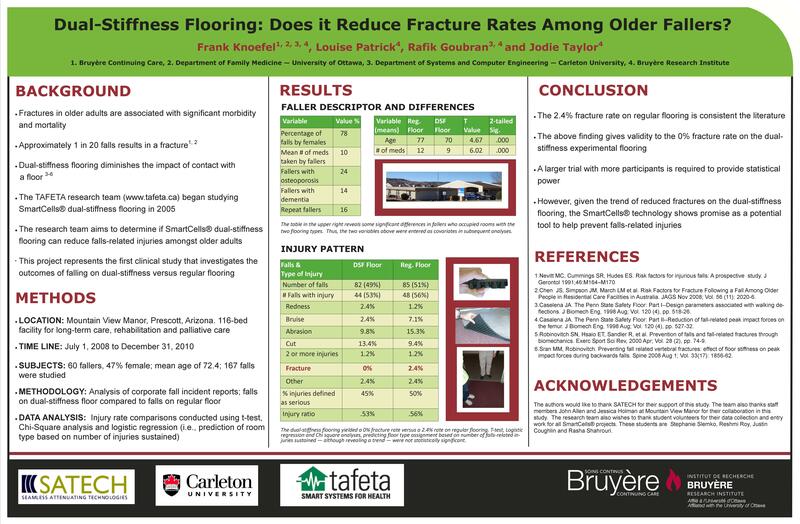 “Dual-Stiffness Flooring: Does it Reduce Fracture Rates Among Older Fallers.” American Geriatric Society (AGS) Conference, Seattle, Washington, May 3, 2012. A. Arcelus, F. Knoefel, R. Goubran, M. Bilodeau, H. Sveistrup. “Can smart bed sensors differentiate between healthy and older adults with mobility impairment?” Canadian Association on Gerontology Annual Scientific Conference, Ottawa, ON, October 2011. D. Townsend, F. Knoefel and R. Goubran. “Privacy versus autonomy: A trade off model for smart home monitoring technologies.” In proc. of International Conference of the IEEE Engineering in Medicine and Biology (EMBC11), Boston, MA, U.S.A., September 2011, pp. 4749-4452. S. Rahimi, A.D.C. Chan, R. Goubran. “Usage monitoring of electrical devices in a smart home.” In proc. of International Conference of the IEEE Engineering in Medicine and Biology (EMBC11), Boston, MA, U.S.A., September 2011. F. Knoefel. “How does hSITE impact older adults?” hSITE: (Healthcare Support through Information Technology Enhancements) Annual Scientific Conference, McGill University, Montréal, QC, June 2011. G. Green, A. Chan, R. Goubran. “Tracking Food Spoilage in the Smart Home using Odour Monitoring.” In proc. of IEEE International Symposium on Medical Measurements and Applications, Bari, Italy, May 2011, pp. 284-287. D. Townsend, F. Knoefel, R. Goubran. “Video Monitoring: A Trade-off Between Privacy and Autonomy.” IEEE Canada WIE National Conference 2011 – Symposium on Future Friendly Technologies (SFFT), April 2011. F. Knoefel, L. Patrick, J. Taylor and R. Goubran. 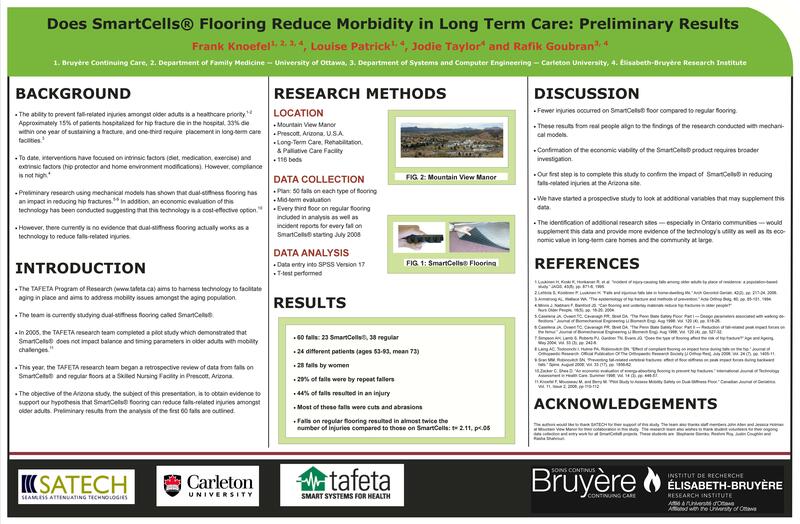 “Does SmartCells® Flooring Reduce Morbidity in Long Term Care: Preliminary Results.” Ontario Long Term Care Association Innovations Expo, Toronto, Canada, 23 November 2010. V. Joshi, A. Arcelus, M. Holtzman, R. Goubran, F. Knoefel. “Advanced Sensors for Remote Patient Monitoring.” IEEE Workshop on Adverse Response Monitoring, Ottawa, ON, December 2010. R. Roy, F. Knoefel, R. Goubran, V. Emerson, J. Chauvin, J. Taylor. 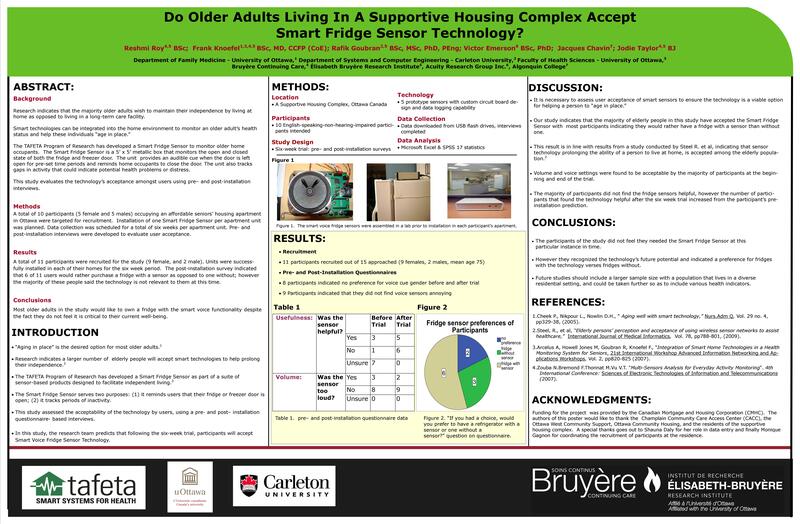 “Do Older Adults Living In A Supportive Housing Complex Accept Smart Fridge Sensor Technology.” Regional Geriatrics Program Annual General Meeting, Ottawa, Canada, October, 2010. R. Roy, F. Knoefel, R. Goubran, V. Emerson, J. Chauvin, J. Taylor. 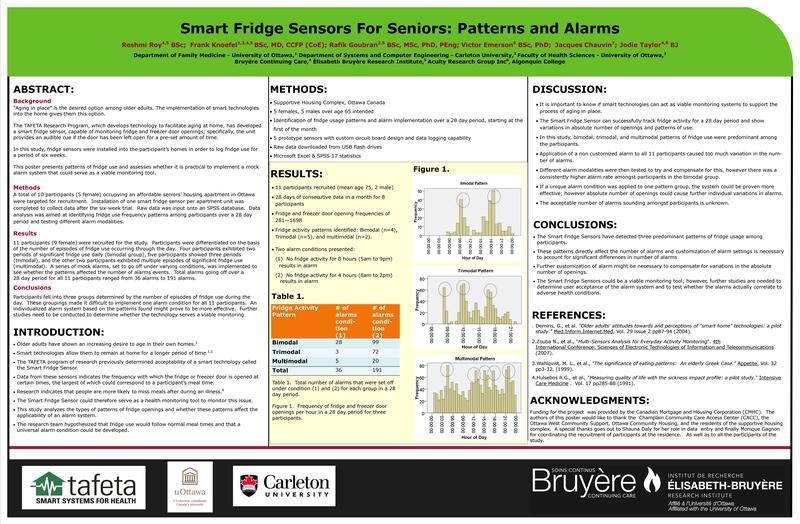 “Smart Fridge Sensors For Seniors: Patterns and Alarms.” Regional Geriatrics Program Annual General Meeting, Ottawa, Canada, October, 2010. A. Tosine, H. Nguyen, V. Joshi, D. Doran, A. Parush, R. Goubran, S. Doherty and E. Sadowski. “User Research of a Proposed Home Care Clinicians Non-intrusive Remote Monitoring Systems Graphical User Interface.” Presented at the Conference of e-Health 2010, Vancouver, Canada, May 30-June 3, 2010. S.T. Doherty, R. Goubran, D. Doran, A. Tosine, and H. Nguyen. “An Automated Remote Monitoring System of Homecare Client’s Nightly and Daily Activity Patterns: System Design and Outputs.” Presented at the Conference of e-Health 2010, Vancouver, Canada, May 30-June 3, 2010. A. Arcelus, R. Goubran, F. Knoefel, H. Sveistrup and M. Bilodeau. “Context-aware smart home monitoring through pressure measurement sequences.” In proc. of IEEE International Workshop on Medical Measurements and Applications (MeMeA 2010), Ottawa, Canada, May 2010. M. Holtzman, D. Townsend, R.Goubran and F. Knoefel. “Validation of pressure sensors for physiological monitoring in home environments.” In proc. of IEEE International Workshop on Medical Measurements and Applications (MeMeA 2010), Ottawa, Canada, May 2010. S. Mondoux, P. Carlson, N. Foubert, A. Arcelus, F. Knoefel, R. Goubran, M. Bilodeau and H. Sveistrup. 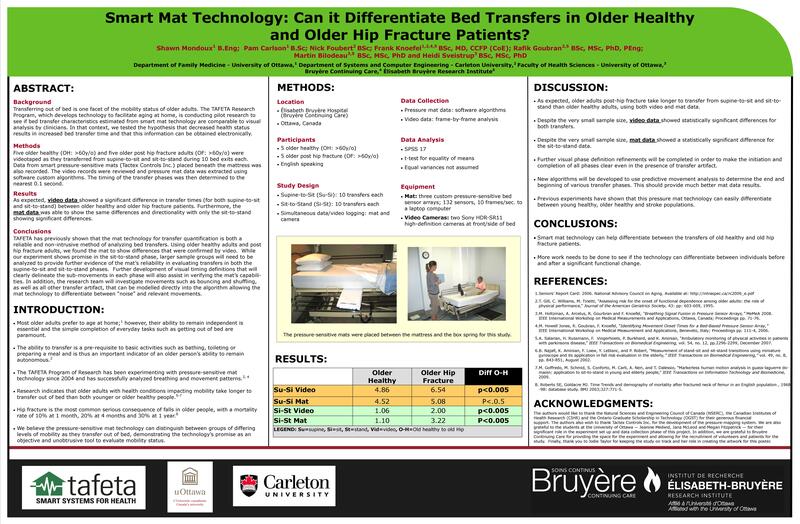 “Smart Mat Technology: Can It Differentiate Bed Transfers in Older Healthy and Older Hip Fracture Patients?” Regional Geriatrics Program Annual General Meeting, Ottawa, Canada, October, 2009. M. Townsend, R. Goubran, M. Frize, F. Knoefel. “Preliminary Results on the Effect of Sensor Position on Unobtrusive Rollover Detection for Long-Term Sleep Monitoring in Smart Homes.” In proc. of International Conference of the IEEE Engineering in Medicine and Biology Society, (EMBC’09), Minneapolis, Minnesota, USA, September 2009, pp 6135-8. D. Kessler, F. Knoefel, V. Emerson, R. Goubran, M. Bilodeau, J. Taylor and K. Onyett-Jeffries. 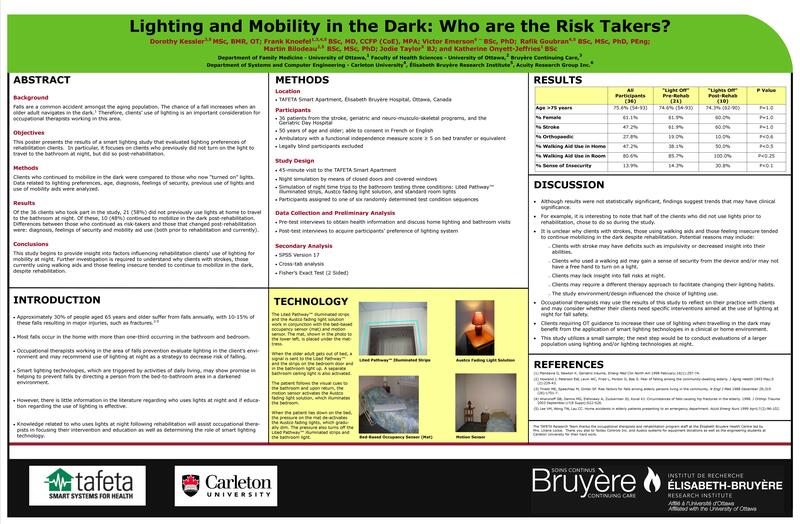 “Lighting and Mobility in the Dark: Who are the Risk Takers?” Canadian Association of Occupational Therapists Annual General Meeting, Ottawa, Canada, June 2009. P. Carlson, N. Foubert, F. Knoefel, R. Goubran, M. Bilodeau, H. Sveistrup, and J. Taylor. 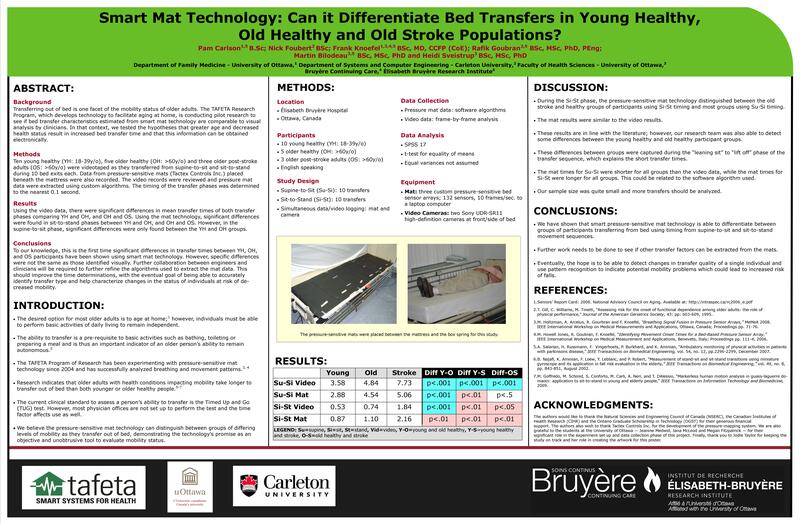 “Smart Mat Technology: Can It Differentiate Bed Transfers in Young Healthy, Old Healthy and Old Stroke Populations?” Canadian Geriatrics Society Annual General Meeting, Toronto, Canada, April 2009. M. Holtzman, A. Arcelus, I. Veledar, R. Goubran, H.i Sveistrup, and P. Guitard. “Force Estimation with a Non-Uniform Pressure Sensor Array.” In proc. of IEEE International Instrumentation and Measurement Technology Conference (I2MTC 2008), Victoria, Canada, May 2008, pp. 1974-1979. F. Knoefel, V. Emerson, R. Goubran, M. Bilodeau, J. Morley, and K. Onyett-Jeffries. “Do Older Adults Prefer “Smart” Lighting Cues in a Darkened Home Environment?” Canadian Geriatrics Society Annual General Meeting, Montreal, Canada, April 2008. F. Knoefel, M. Mousseau, and M. Berry. “Pilot Study to Assess Mobility Safety on a Dual-Stiffness Floor.” Canadian Journal of Geriatrics, pp. 110-112. Vol. 11, Issue 2, 2008. K. Onyett-Jeffries, V.r Emerson, F. Knoefel, R. Goubran and M. Bilodeau. “Do Older Adults Prefer “Smart” Lighting Cues in a Darkened Home Environment?” Regional Geriatrics Program Annual General Meeting, Ottawa, Canada, October 2007. F. Knoefel, L. Patrick and R. Goubran. “SmartCells Dual-Stiffness Flooring: Does it Reduce Falls-Related Injuries Among Frail Older Adults?” Regional Geriatrics Program Annual General Meeting, Ottawa, Canada, October 2007. F. Knoefel, L. Patrick and R. Goubran. “SmartCells Dual-Stiffness Flooring: Does It Reduce Falls-Related Injuries Among Frail Older Adults?” International Conferences on Caregiving, Disability, Aging, and Technology (FICCDAT), Toronto, Canada, June 2007. A. Arcelus, M. Howell Jones, R. Goubran and F. Knoefel. “Integration of Smart Home Technologies in a Health Monitoring System for the Elderly.” In proc. of 21st International Conference on Advanced Information Networking and Applications Workshops (AINAW’07), Niagara Falls, Canada, May 2007, vol. 2, pp. 820-825. M. Howell Jones, A. Arcelus, R. Goubran and F. Knoefel. “A Pressure Sensitive Home Environment.” In proc. of IEEE International Workshop on Haptic Audio Vidual Environments and their Applications (HAVE 2006), Ottawa, Canada, November 2006. F. Knoefel, M. Berry and M. Mousseau. “Balance and Mobility of Older Rehab Patients on a SmartCell Floor.” Geriatric Research and Program Development Day, Ottawa, Canada, March 2005. F. Knoefel, B. Schulman and E. Bremner. “TAFETA: Smart Apartments for Older Adults.” 2005 University of Ottawa Research Showcase, Ottawa, Canada, February 2005. F. Knoefel, B. Schulman and E. Bremner. “TAFETA: Smart Apartments for Older Adults.” Canadian Association on Gerontology, Victoria, Canada, October 2004.